Kementerian Komunikasi dan Informatika Republik Indonesia - Kementerian Kominfo or referred to as "KOMINFO" is the Ministry of Communications and Informatics of Republic Indonesia. The Ministry formerly known as Departemen Komunikasi dan Informatika (Depkominfo) or the Department of Communications and Informatics. KOMINFO is an Indonesian ministry which oversees the communication and informatics affairs. The Ministry is responsible directly to the President of Republic Indonesia and led by a minister. Since 27 October 2014, KOMINFO was led by Rudiantara as the Minister for Communications and Information Technology (MENKOMINFO). Rudiantara was appointed by the President Joko "Jokowi" Widodo as MENKOMINFO in the Working Cabinet (Kabinet Kerja) Indonesia to replace Tifatul Sembiring. 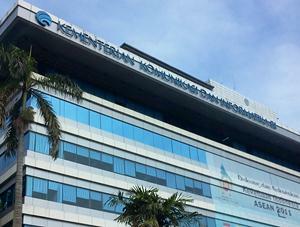 KOMINFO is based in Jakarta and its head office is registered at Jl Medan Merdeka Barat No 9 Jakarta 10110. According to information found in KOMINFO's website as cited by JobsCDC.com, KOMINFO is organized as 7 units and 5 expert staffs, namely General Secretariat, Directorate Generals (DG) of Resources and Post Device and Informatics, DG of the Post and Information Implementation, DG of Informatics Applications, DG of Public Information and Communication, General Inspectorate, Agency of Research and Human Resource Development, Expert Staff of Law, Expert Staff of Social, Economics and Culture, Expert Staff of Communication and Mass Media, Expert Staff of Technology, and Expert Staff of Politics and Security. Maximum age of 29 years old and not married (single). Minimum D3/S1 degree in Computer Science, Informatics. Strong understanding in implementing object-based programming. Expertise with PHP 7. * PosgreSQL database and Laravel framework. Skilled in React, GraphQL and Node.js will be an advantage. Eager to learn and grow together as a team. Strong interest in technology, programming and software development. JobsCDC.com now available on android device. Download now on Google Play here. Please be aware of recruitment fraud. The entire stage of this selection process is free of charge. 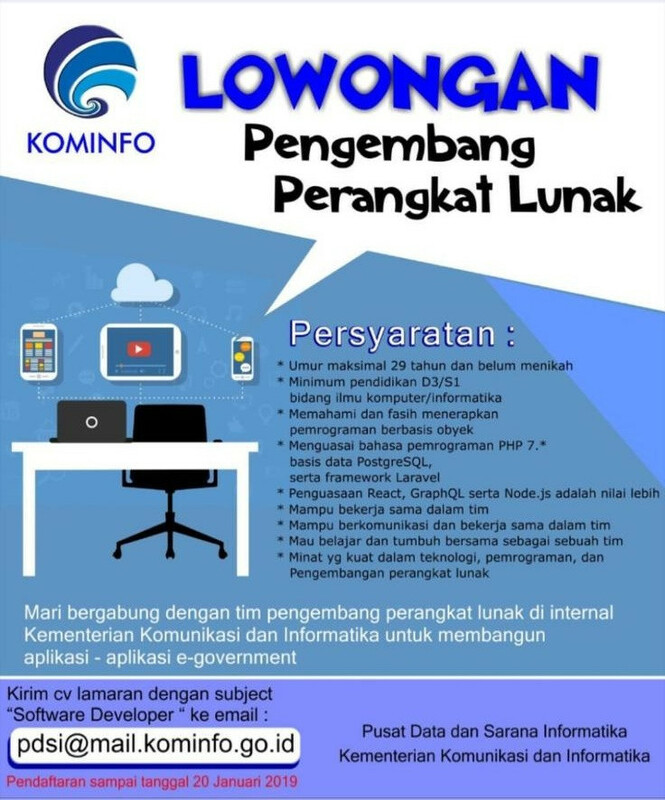 Kementerian Kominfo - D3, S1 Software Developer PDSI Non CPNS KOMINFO January 2019 will never ask for fees or upfront payments for any purposes during the recruitment process such as transportation and accommodation.